Today we have our first post from our August Guest Designer, Kara from Bright Hope Creations! We are so in love with her amazing coloring and fun bright and colorful cards. We are so happy to have her join us this month and we can't wait to share what she has created with our stamps! Keep reading to find out more about Kara today and to check out her first project below! Hi, I’m Kara of Bright Hope Creations (formally Kara Lynne Card Designs). I live in Kimberly, Wisconsin with my wonderful husband and our two amazing daughters (ages 16 and 14). I love designing clean and layered cards, creating scenes, and adding dimension. Copics are my favorite coloring medium as you will see this month, and I’ve been practicing with no-line coloring lately. I am so excited to guest design for Newton’s Nook and hope to inspire you with their creative and adorable images! I have three cards today featuring the newly released set, Cozy Campers. These retro campers remind me of the one we had when I was growing up! The first one was designed with that all too often sloping camp site in mind. We camp a lot in the summer with our pop-up camper. My daughter looked at this card and said, "Oh that reminds me of when..." Yep, that's how we roll! 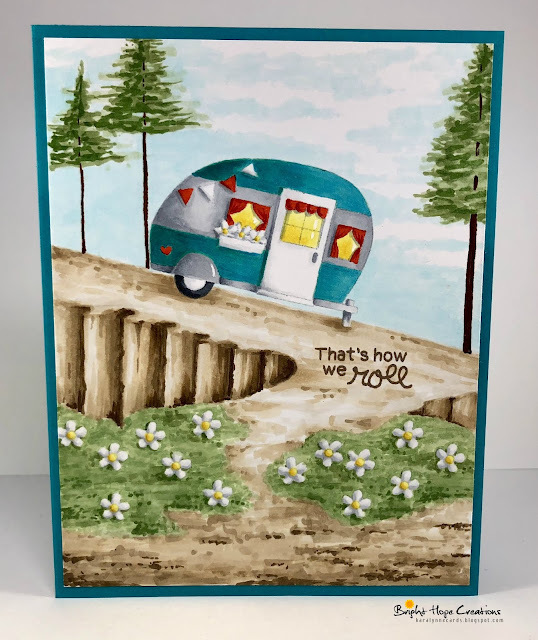 To create this card, I stamped the camper and flowers in a light gray ink and then lightly drew out the background with a pencil, erasing the pencil lines as I colored. The second card is a birthday card. 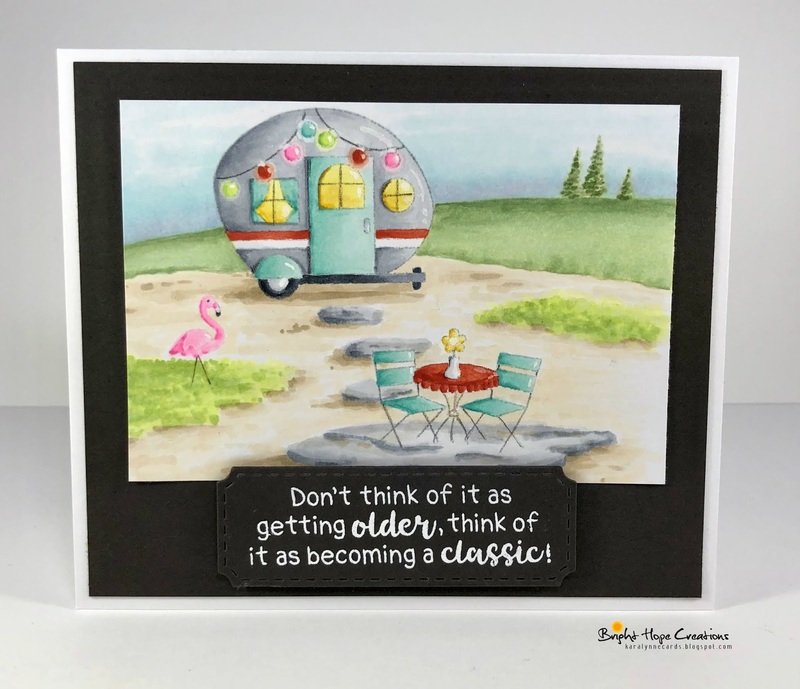 I love how the retro camper, flamingo, and metal table and chairs match up so well with this sentiment from the Birthday Essentials stamp set. This card was created much like the first one. The sentiment is longer than the die from Framework dies, so I extended it with partial die cutting. There are so many ways to color these images, so that's what I did for my final card today. I kept some elements the same such as the lights, flags, window light, and wheels, but changed up other elements to create a colorful campground. 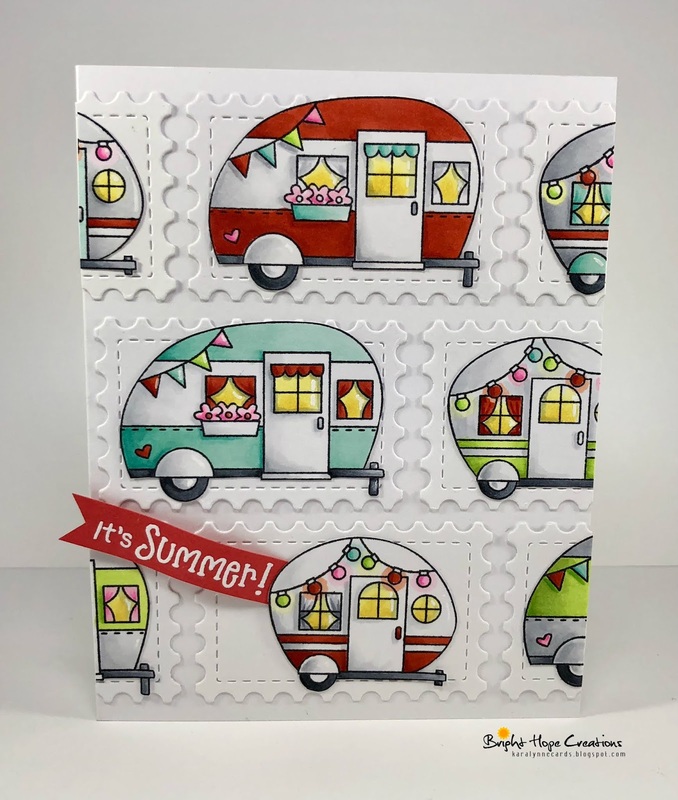 The sentiment comes from the newly released Newton's Summer Treats Stamp Set and each camper sits upon a die cut from the Framework Die Set. Thanks so much for spending time with me today, and thank you, Newton's Nook for the honor to be this month's guest designer! Have a great week! Wow... amazing scenes you created! Your drawing/coloring is so awesome! Oh my goodness, these are amazing! I wasn't disappointed Kara, these are magical and wonderful and you are amazing my friend! These are all fantastic Kara! So, so fun with the little scenes you've created. I especially enjoyed the camper on the hill, "That's How We Roll" haha! Super cute and I'm so happy to see you guest designing here. Can't wait to see more! WOW!! All of these cards are STUNNING!! Your coloring is fabulous!!! All three are spectacular!! I have no words for your coloring, I'm in awe!! I love the coloring on tour cards. It's really fun to see! WOW!!! Oh my Kara... You are such an artist and those cards are priceless! I'm speechless! Congratulations on being guest designer and what fantastic cards you made! You are a great artist to draw in the back ground on the card. The scene on the second card is just delightful and just what camping looks like. Love the campground too. Congrats on the GD spot! They were smart to pick you! WOW!! Amazing cards by Kara!! She has done an amazing job of showcasing your new stamp release. LOVE it!